London has been voted the “World’s Leading Destination” at this year’s World Travel Awards, which took place November 7. It beat off fierce competition from New York, Cape Town, Rio de Janeiro and Sydney to take the award, which is seen as one of the most prestigious in the travel world. 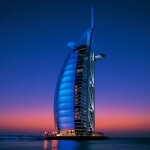 The World’s Leading Hotel gong went to the Burj Al Arab in Dubai, despite rivalry from 26 other properties including the Armani Hotel in Dubai, the Taj Mahal Palace & Tower in India, the Hotel Ritz Paris and the Emirates Palace in neighboring Abu Dhabi. The hotel was also deemed to have the World’s Leading Presidential Suite, a 667 square meter duplex with private bar, library, dining area, spa and chauffeur-driven Rolls Royce. It was also an excellent night for Abu Dhabi, which picked up several awards, including a major prize for its flag-carrier Etihad, which took the award for World’s Leading Airline. It is the second year in a row that Etihad has won, with the airline’s boss James Hogan saying it was a “phenomenal and unprecedented achievement for an airline that is only seven years old. Etihad also took the World’s Leading First Class prize, beating other nominees that included American Airlines, Emirates, Singapore Airlines and Virgin Atlantic. Separately, Abu Dhabi Tourism Authority was judged “World’s Leading Tourist Board” for the second year running, just as it announced its 2011 hotel guest target of 1.9 million, a 15 percent year-on-year increase. Other key awards included World’s Leading Casino Resort (Resorts World Genting, Malaysia), World’s Leading Cruise Line (Royal Caribbean), World’s Leading Island Destination (Mauritius) and World’s Leading Spa Resort (Le Royal Meridien Beach Resort & Spa, Dubai). Jamaican sprinter Usain Bolt was chosen as this year’s Face of Travel for his work with the Jamaican tourist board.